STEP 2. Overlay base with 25mm of free draining course sand or gravel. Course river sand or cracker dust is ideal, depending on availability. This acts as a bedding layer for the blocks and should be screeded perfectly level before laying of blocks. STEP 3. Lay blocks in a unidirectional formation. Direction of formation should be carefully planned, to avoid unnecessary cutting of blocks on the edges. STEP 4. Once blocks are laid, a concrete apron or curbing should be placed around the edge of the area to keep the formation in place. STEP 5. Fill* hollows with free draining material – course sand or gravel is ideal, (when planting with grass, hollows are to be filled with fertile soil). *Blocks are to be filled to the top. This aids in distributing load pressure and helps to avoid point loading and cracking. From time to time paving hollows may need to be topped up with extra gravel/fill. STEP 6. 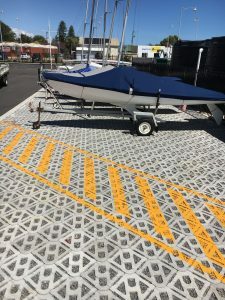 Compact surface with rubber wheel roller or similar, so that blocks are well bedded and level. 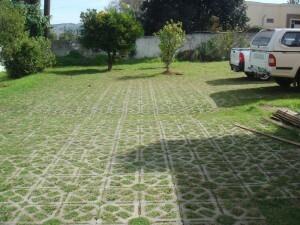 Using Permeable pavers significantly reduces runoff and improves water infiltration back into the water table. This is also a low cost and low maintenance system which should give many years of service. 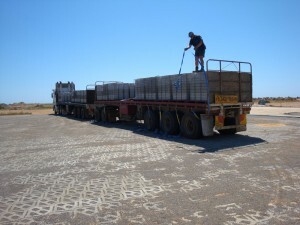 Terracrete Permeable Pavers are also highly robust, designed to withstand heavy vehicles. Other benefits span from being plantable (which gives the the diversity to become grass pavers), to cooling down the local area (by allowing the water to filtrate into the ground, the surface and the surrounding area will be much cooler that a hard impervious surface). The installer must be aware that individual site conditions, and types and frequency of traffic vary, and that this is a general guide only and not an engineered specification.